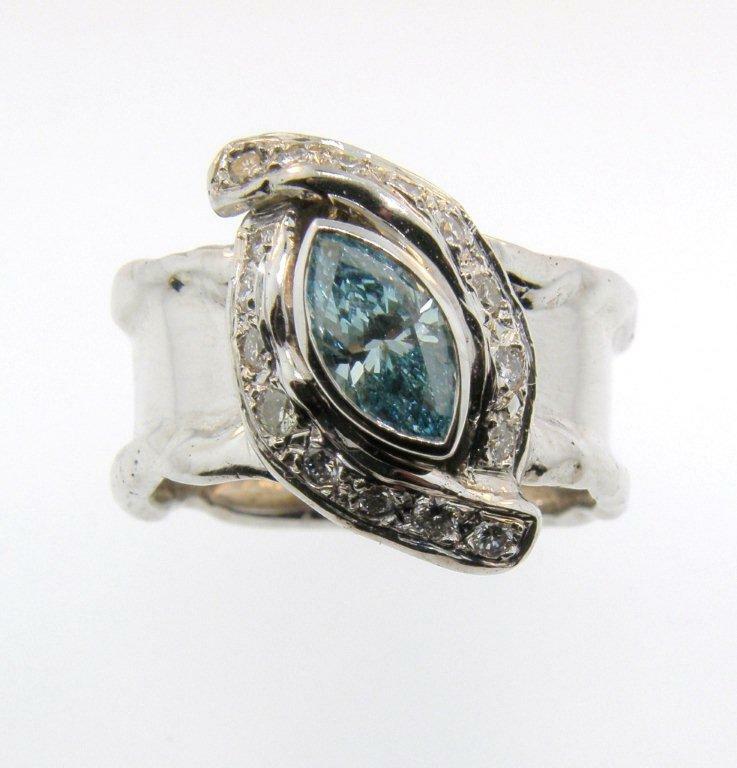 This completely hand fabricated ring features a .78 carat Medium to light blue HPHT treated diamond. 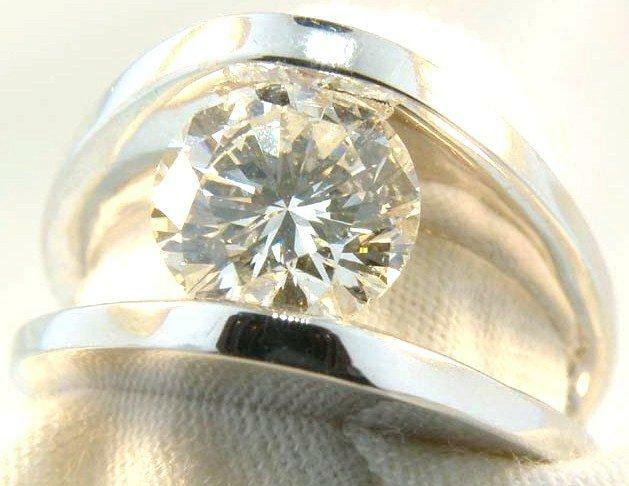 It is accented with .26 carats of SI1 G-H color diamonds in 14 karat white gold. Size 8 ½. 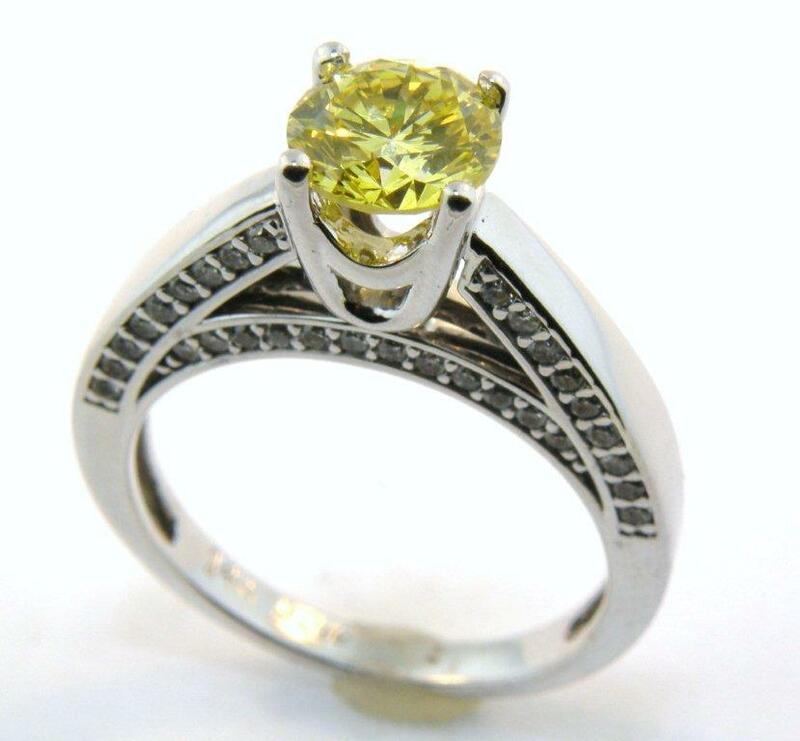 This 14 karat white gold ring features a Canary Yellow Diamond which has been subjected to HPHT treatment. The diamond weighs 1.04 carats and is SI1 in clarity and a medium dark yellow in color. The sides of this cathedral mounting are set with approximately .28 carats of white diamonds which are SI@ in clarity and H to J in color. The ring has an insurance replacement appraisal of $7500. Size 7. This ring is made up of a total of 1.48 carats of diamonds which are SI1 and G to H in color, giving the appearance of a much larger three stone ring. It is set in 14 karat white gold. Size 6½. 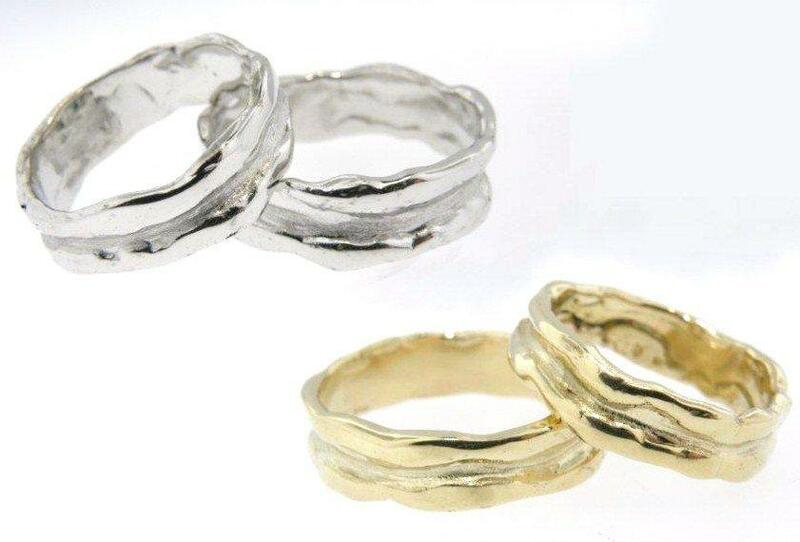 We make each of these rings individually by hand, so no two will be alike. These are available in 14 or 18 karat white, yellow or rose gold. The price is determined by the gold weight which typically is roughly $550 for size 6 and $800 for size 10 rings in the 10 mm width shown these rings can be heavily customized. We advise you to call us for more information! This simple yet substantial and elegant ring features a .77 carat marquise diamond which is SI2 in clarity and E in color. 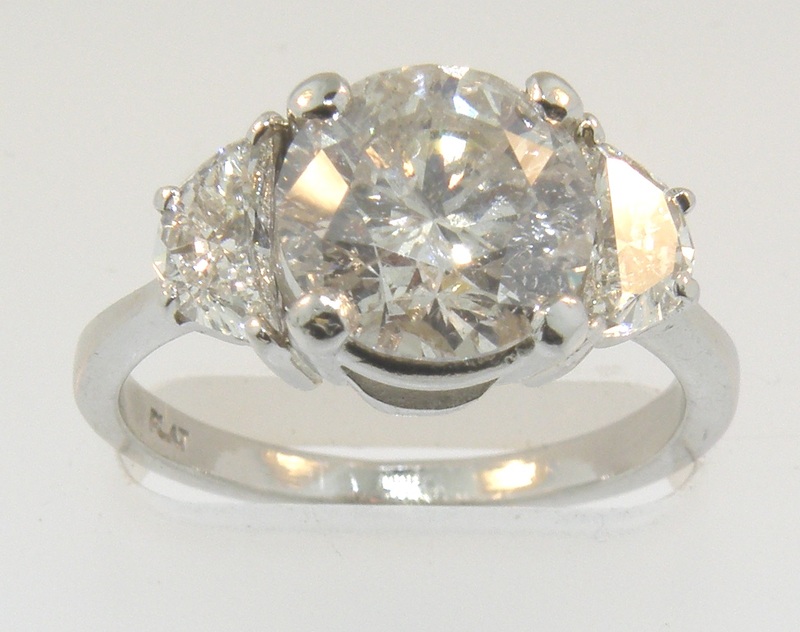 The ring has an appraised value of $6800 and the stone carries a laboratory certificate. Size 6 ¾. 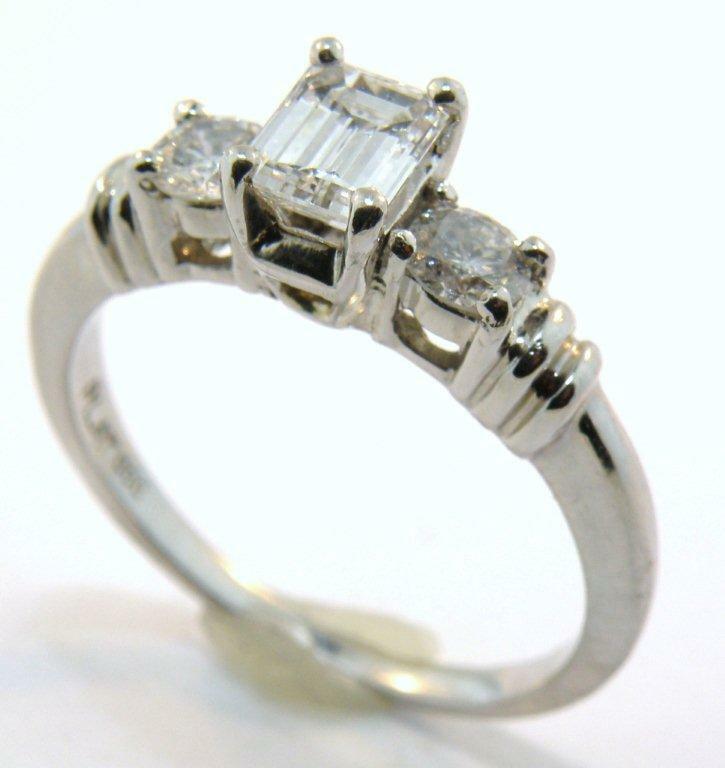 This platinum ring features a .66 carat emerald cut center stone with VS1 clarity and G color. 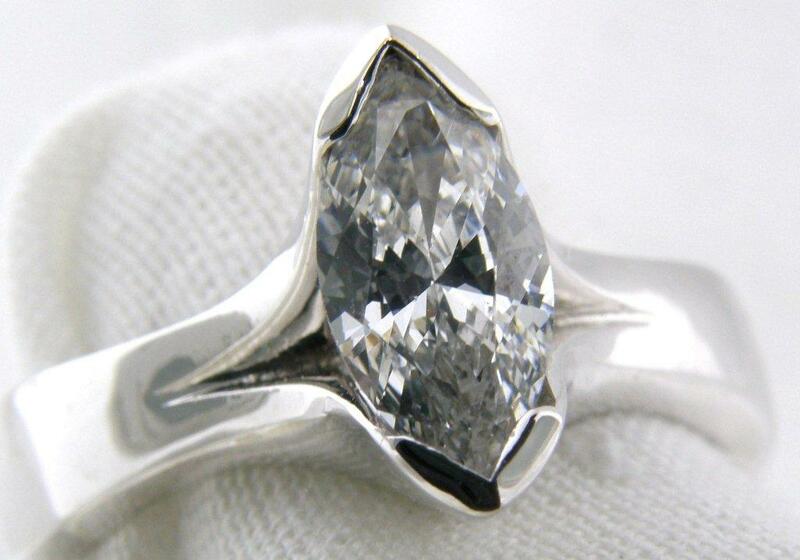 The center stone is flanked by two .14 carat side stones which are SI1 G to H color. Size 7 ¼. 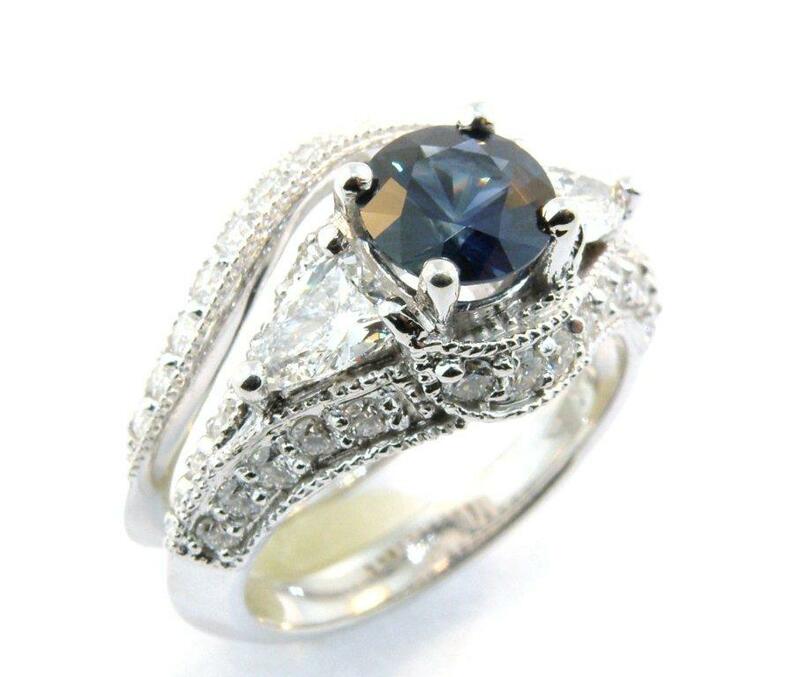 The center stone of this spectacular set is a 1.26 carat medium to dark blue fine sapphire flanked by two shield cut diamonds, each weighing approximately 30 points and having a clarity of VS2 and color of F. There are also 70 points of diamonds accenting the shoulders and band of this ring which are all SI clarity and G color as well as .35 carats of SI /G diamonds in the perfectly matching band. Size: 6 ½. 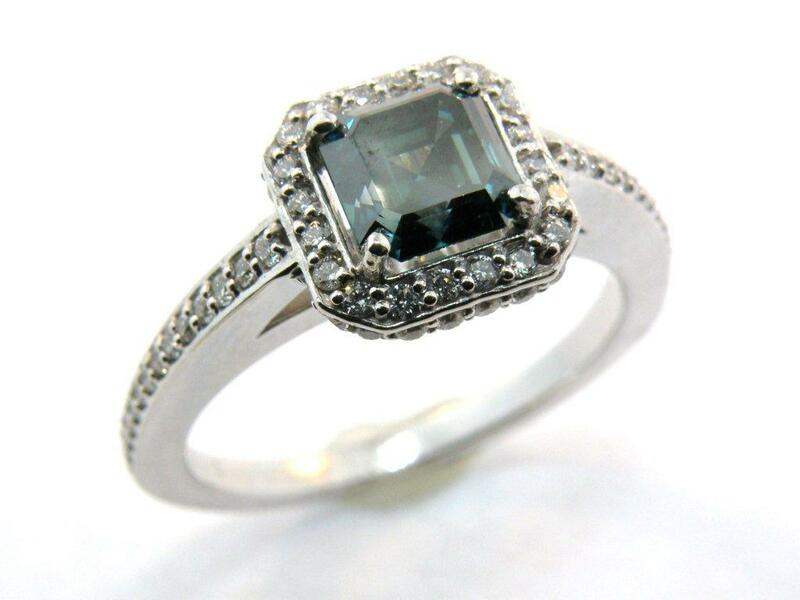 This unique piece features a 1.04 carat square emerald cut SI1 Blue - Green diamond which has been subjected to HPHT treatment. The surrounding diamonds are SI1 in clarity and G to H in color, weighing 3/8 of a carat. The ring is appraised for insurance purposes at $7225 and the diamond has a laboratory certificate. Size 7. This architecturally inspired ring uses tension to house a 1.5 carat Round Brilliant diamond. The diamond that is featured is 1.5 carats and SI2 in clarity, G - H in color. 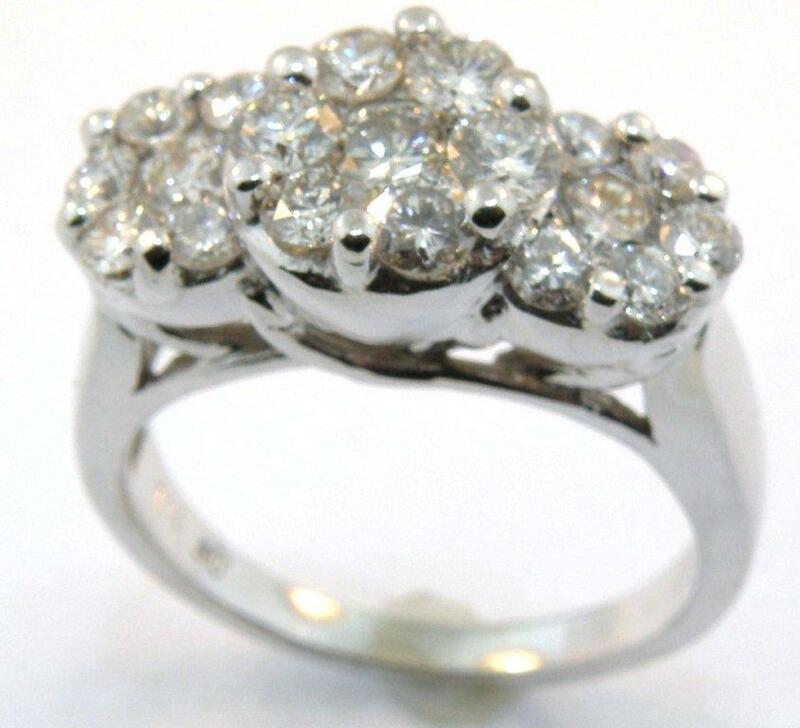 This ring is also suitable for smaller or larger size stones as well as ovals and princess cuts. Size 6. This ring is simple but elegant, with a center round brilliant cut diamond of 2.63 carats, with clarity of I1 and color of J, flanked by two half moon cut diamonds weighing a total of .86 carats. All set in Platinum, size 6 ½. A wonderful wedding engagement band to wear by itself or even as a right hand ring to commemorate a special anniversary, this ring features a center princess cut diamond weighing .70 carats,with clarity of VS2 and color of E. On each side of the center are .49 carats of baguettes, clarity of VS2 and color of G. Flanking these are .16 carats of round brilliant diamonds, clarity of SI1 and Color of H. Size 6 ½. 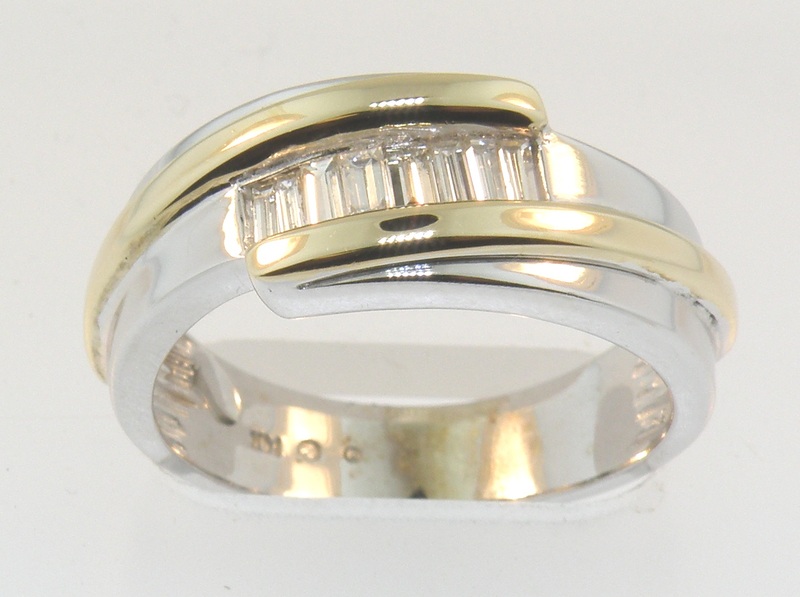 This is a 14 karat white gold band with yellow gold accents along side a channel of .50 carats of diamond baguettes. The baguettes have clarity of VS and color of G. An attractive and masculine ring! 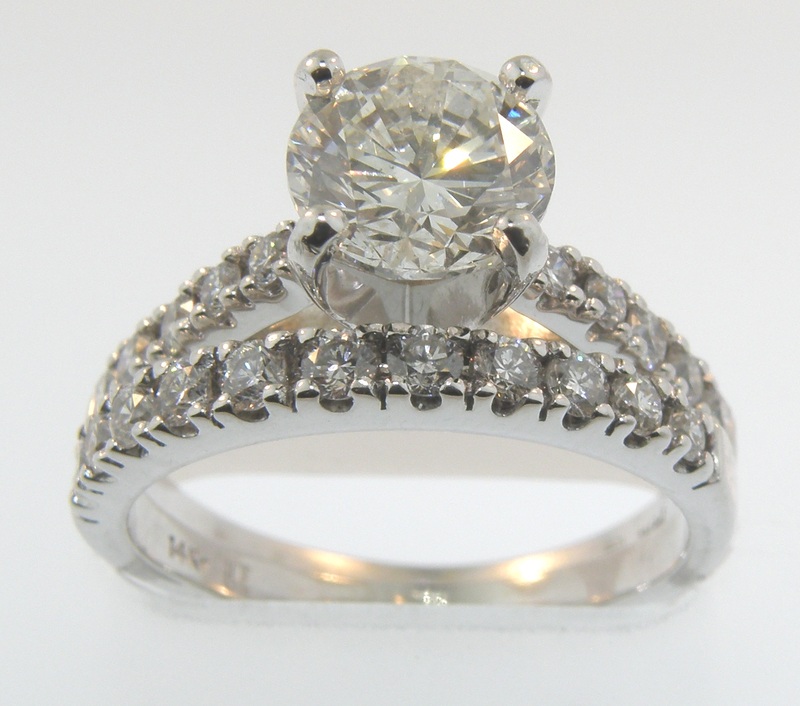 This elegant set features a 1.5 carat round brilliant cut diamond center stone, with clarity of SI1 and color of G-H. 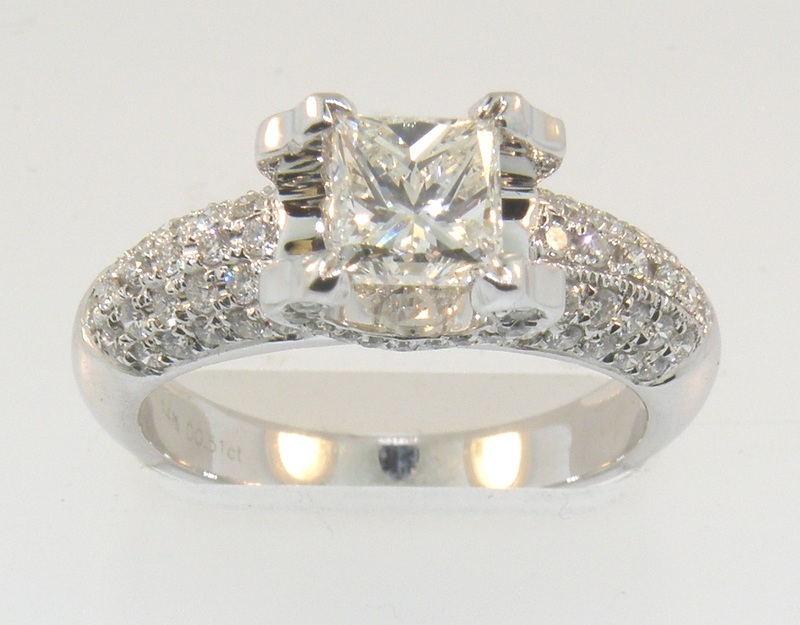 The engagement ring and matching diamond band have a total of .57 carats of accent diamonds, all SI1 and G-H. 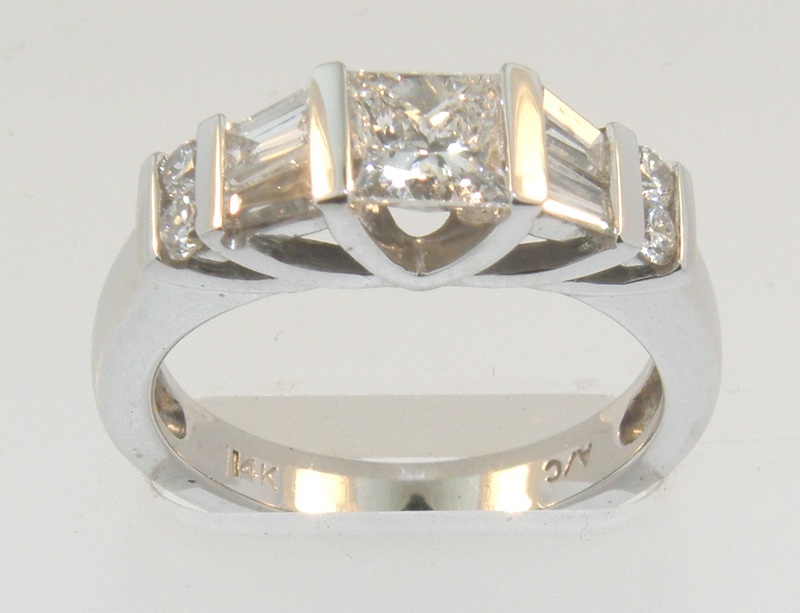 The rings are cast of 14 karat white gold and the center diamond is set in platinum prongs. Size 6. This unusual diamond ring features a 1.01 carat princess cut diamond in the center, held by pave' diamond prongs and four rows of pave' diamond on each side of the center, for .51 carats of pave' diamonds. . The center diamond is VS2 in clarity and H-I in color, and the pave accent diamonds are SI1 and G-H in color. You won't lack for bling with this one!